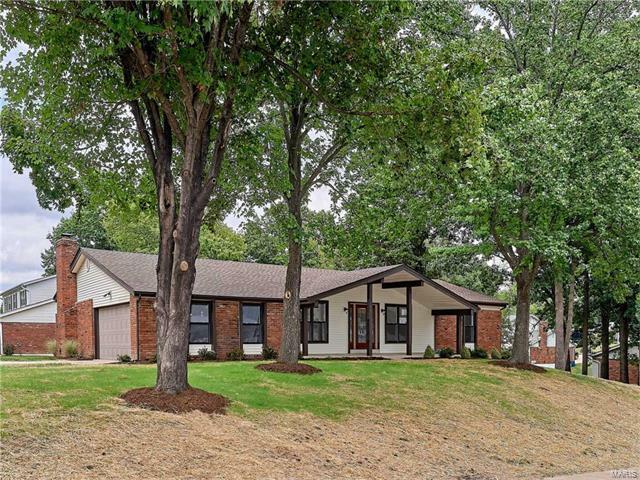 Another fabulous professional rehab presented by Wren Realty-spectacular ranch in highly sought after Lafayette Woods subdivision shows like new construction! Great room with vaulted ceiling & fireplace leads out to large bright sunroom with lots of windows. Stunning high end updated kitchen with new 42" maple glazed cabinets, travertine tile backsplash, new stainless/black appliances & granite countertops which also opens to sunroom. Totally remodeled baths with new vanities, medicine cabinets, toilets & ornate ceramic tile! Gleaming refinished hardwood floors in great room, dining room, family room, kitchen & sunroom. New carpet in bedrooms and basement. New furnace, a/c, windows and electric service. Newer roof. New six panel doors, designer lighting & Hunter ceiling fans. Newly finished basement with new egress window features huge recreation area bedroom & full bath with ceramic tile. Total professionally refinished living area over 3200 sq ft at less than $100 per square foot! From Manchester, south on Ries Rd to left on Ries Bend to left on Windcliffe to right on Breezeview. OR from Big Bend, north on Ries Rd to right on Ries Bend to left on Windcliffe to right on Breezeview. Located on corner of Breezeview & Amber Jack.